The California Public Utilities Commission, at the urging of Governor Arnold Schwarzenegger, has approved the country's largest solar energy program, which is expected to boost solar energy production by 3,000 megawatts. In what is being seen as a significant vote of support for alternative power, the California Public Utilities Commission (PUC) has approved the United States' largest solar energy program to date, an initiative which will provide $2.9 billion over 11 years to boost solar energy production by 3,000 megawatts. While the commission is holding hearings to determine how the far-ranging California Solar Initiative (CSI) will be implemented, supporters say it should help increase the state's energy supply in an environmentally friendly way. "When you look at all of the new houses being built in California's Central Valley and down south in the Inland Empire, those houses will use a lot of air conditioning, and that's going to be a huge future power requirement," says Barry Cinnamon, president of the California Solar Energy Industries Association in Rio Vista, Calif. "You have to start somewhere. Three thousand megawatts may sound like a lot, but the state will probably need 300,000 megawatts. "But it's clean. It's the most elegant technology I've ever come across. The equipment lasts 30 to 40 years. It's just the way a rooftop should be." Although the 3,000 MW goal is a fraction of the 60 gigawatts the state is expected to need from new energy sources by 2030, it's still lofty compared with existing solar generation. From 1981 until the present, photovoltaic units with a capacity of about 130,000 kilowatts have been connected to the California power grid, according to the California Energy Commission's Emerging Renewables Program. The 3,000 MWs, coupled with the state's ongoing push for energy efficiency, should help California meet the required 60 GW, says PUC Commissioner Dian Grueneich. During 2006, 2007 and 2008, the state's utilities will spend $2 billion outside of the CSI to boost energy efficiency, Grueneich says. "Studies indicate for every dollar spent, there will be $2 in savings by the utilities since they won't have to pay for more expensive generation," she says. "Energy efficiency should be the first investment, since it is the most environmentally friendly of sources. The solar initiative is a way we can get people to do more." Last fall, California Gov. Arnold Schwarzenegger approached PUC members about taking an administrative approach to solar incentives after the state's Legislature failed to adopt two similar bills the past two years, Grueneich says. The most recent, Senate Bill 1--also known as the Million Solar Roofs Bill--mirrored much of the CSI. Depending on how it's implemented, Cinnamon says the CSI should ensure steady, long-term growth for the entire solar industry. "There will be more marketing, more awareness and more production facilities being built to provide solar panels," says Cinnamon, president of Akeena Solar Inc. in Los Gatos, Calif. "Installers will still be in business here in three years rather than the start-stop atmosphere of the past." The increased demand will also spur new manufacturing, boost overall industry efficiency and lower photovoltaic panel prices while increasing value, much like what happened in the electronic and computer industries. "There's no doubt in my mind that 10 years from now the industry is going to be going without incentives," he says. Cinnamon points to the success of Japan's 10-year solar incentive program, which is winding down, as reason for his optimism. "It spurred investments in all of the value chains, from the customer to the industry--everybody gets more efficient," he says. The challenge for stakeholders, as well as the PUC and California Energy Commission, will be to develop rules that promote growth in solar development and balance it with a smooth flow of incentive funding. Grueneich says the commissioners hope to have the program's details finalized for a public rollout Jan. 1, 2007. Cinnamon cites the problems with New Jersey's rebate program as what he'd like to see California avoid. 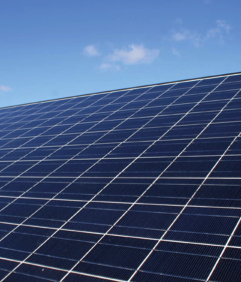 The Garden State offers one of the highest solar energy system incentive programs in the United States. New Jersey residential, business and commercial customers receive direct rebates of $4.35 per watt for systems up to 10 kW. For business and commercial systems of more than 10 kW, the rebate is $4.35 up to the first 10 kW, $3.30 per watt for the next 30 kW and $3 for the next 60 kW. In addition, photovoltaic systems are not subject to the state's six percent sales tax. "The incentives in New Jersey were so good, they used up all of the money," says Cinnamon, adding that Akeena also has an office in Fairfield, N.J. "There are installation crews and panels, but the state is figuring out where to get the incentive money. So it will be a challenge for our policy makers to get the incentives operating on a steady basis." Cinnamon also points out that past California commercial solar rebate programs ran out of funding within a few months. "It makes it hard for companies installing it 12 months per year," he says. Complicating the rulemaking process are outside factors, Cinnamon says. For 2006 and 2007, the federal government increased residential solar rebates to 30 percent from 10 percent. The federal government also adopted a 30-percent investment tax credit and an accelerated 5-year depreciation scheduled for commercial solar units. In addition, top-tier electric rates for some California residential customers climbed from 21 cents to 31 cents, which is even higher than at the peak of California's energy crisis in 2001. Projects that may have looked financially unattractive in the past suddenly provide positive cash flow, Cinnamon says. Authority over the $2.9 billion will be divided between the California PUC and the California Energy Commission. The PUC will oversee a $2.5 billion program for commercial and existing residential customers. The funds will be divided among the state's four investor-owned utilities: Pacific Gas & Electric, San Diego Gas & Electric, Southern California Edison and the Southern California Gas Co.
Public utilities, such as the Sacramento Metropolitan Utility District and Los Angeles Department of Water and Power, were not included initially, but Grueneich admits there's growing pressure to add them. The initiative will be funded through monthly distribution fees charged by the four investor-owned utilities. They will amount to an average of $14 annually on residential electric bills and an average of $2 annually on residential gas bills. Unlike previous programs that involved rebates, the solar initiative instead provies performance-based per-watt incentives to customers who install photovoltaic units. "We are using ratepayers' money, so we want to make sure they get the benefit of the program, which means we will consider payment for actual electricity delivered as opposed to having equipment on rooftops that may or may not work," Grueneich says. "We assume that it will be delivered or saved, and that means our utilities don't need to go out and buy fossil fuel power or build new power plants." The incentives started at $2.80 per watt for photovoltaic systems in January and will decrease about 10 percent annually for the life of the program. During 2016, the last year of the program, incentives will be 25 cents per watt. Two existing plans--the Self-Generation Incentive Program (SGIP) and the Emerging Renewables Program--will be rolled into the CSI in 2007. The SGIP, administered by the state's four investor-owned utilities, is designed for systems exceeding 30 kW. The Emerging Renewables Program is for systems less than 30 kW. For 2006, the PUC allocated $340 million for solar technologies through the SGIP. Because of the program's popularity, the commission had already received projects representing 91 MWs by March, triggering a rebate reduction. Those who applied before the 50 MW threshold was met will receive $2.80 per watt. It then drops to $2.50 per watt for applicants representing an additional 70 MW of generation. "Where demand for rebates exceeds supply, it is reasonable to assume the incentive levels are higher than they need to be to motivate investment," the commission stated earlier. The PUC has yet to develop incentives for solar thermal electric projects, which are a pilot program in the area served by SDG&E. The CEC will manage a $350 million program targeting new residential building between 2007 and 2011. This year, the program will provide incentives for residential and small commercial solar projects. Customers who install photovoltaic systems of 1 MW or less fall under the PUC's net metering code. If they use more electricity than the solar system feeds back into the power grid during the year, they pay for the difference. But if they generate more electricity than they use, their bills will be zeroed out at the end of the year. The code doesn't require utilities to pay for surplus electricity generated. For that to change, Grueneich says, the state Legislature would have to adopt new provisions. Even before the PUC adopted the solar initiative, major homebuilder Centex Homes saw a future in developing energy efficient homes with rooftop photovoltaic systems, says Jeff Jacobs, Centex director of community development for Northern California. Since 2001, Centex has been part of a team working under the U.S. avbEnergy Department's Zero Energy Home research initiative. The result was Centex's 21st Century Performance Home in Livermore, Calif. The house showcased energy efficient features and solar electric and solar water systems that provided 90 percent to 100 percent of the home's annual energy use. What the California solar initiative will do is raise public awareness of the energy source and make it more mainstream, Jacobs says. "Solar has been viewed by the public as Popular Science technology that required constant tinkering," Jacobs says. "This initiative brings huge visibility to solar and shows that it is in fact, very reliable and very much off the shelf. "What solar has really needed is a champion. The governor has taken on that role, and with his involvement, solar technology will gain more visibility and become a mainstream building feature." This year, Centex broke ground on Avignon, a 30-home solar community near Pleasanton, Calif. Each house, ranging in size from about 3,600 to 4,000 square feet, will feature an energy efficient package and a 3.5 kW rooftop photovoltaic system. Already, the company has sold five houses, and Jacobs says he believes the initiative will help create more demand for similar projects. "With the incentives--the state and the federal--it makes financial sense," he says. "Buyers can include solar because it's the environmentally sensitive thing to do, or just because it makes financial sense." California entered the new millennium facing an energy crisis, caused partly by an attempt to restructure the electricity market and open it to competition. Assembly Bill 1980, which then-Gov. Pete Wilson signed into law in 1996, encouraged large utilities to sell their power-generation facilities and purchase power on the open wholesale market. Several power plants also were taken down for maintenance at a time when the state power supply was already tight, sending prices soaring. In January 2000, a megawatt-hour of electricity sold for about $30. During the peak of the energy crisis, prices spiked to $1,400 per megawatt-hour. Meanwhile, then-Gov. Gray Davis signed orders allowing the California Department of Water Resources to purchase electricity on the open market and sell it at reduced prices to the struggling utilities. The department spent more than $10 billion on electricity. In March 2001, the Public Utilities Commission approved electrical rate increases of up to 46 percent for customers of Pacific Gas & Electric and San Diego Gas & Electric. A month later, PG&E declared bankruptcy, citing billions of dollars of debt. By May 2001, the California Independent System Operator, which oversees about 75 percent of the state's electrical grid, ordered the first of several rolling blackouts. A mild summer, which meant customers weren't using their air conditioners as much, coupled with additional power plants coming on line, helped ease the tight supply. But the state's energy outlook remains unstable. A California Energy Commission draft report estimates the state's electrical-generation facilities will produce 57,377 megawatts from July through September. Of that, about 25 percent will be imported from out of state. As long as summer temperatures are average or below average, which the commission estimates is a 50 percent chance, the state should have enough power to maintain its 15 percent to 17 percent reserves established by the California Public Utilities Commission. Should the summer be unusually hot, Southern California users, in particular, could see electricity interruptions.